Longboards from Atom has always been appreciated by the surfers and this Classic Pintail Longboard is the perfect blend of quality with style for cruising. 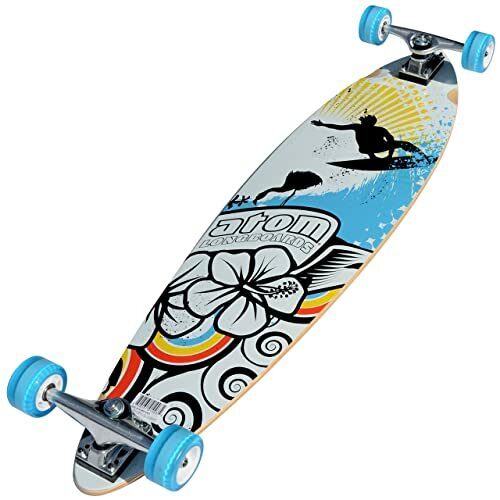 Atom’s Pintail Skateboard is considered as the absolute board for beginners. The article provides a complete insight on this pintail board, which will guide you through the excellence Atom has created. is designed specifically for those entering this arena as a beginner. The longboard is designed with a graphical print that is fashionable in the skateboard world. It is typically longer than a skateboard helping in easy and faster maneuvering. The unique design and finish of this longboard along with its durability will definitely last the customer a long time before they need to invest in a new longboard. The longboard comes in a total of 39 inches in length and 94 inch deck width. The total weight of the longboard along with all the parts is 7.3 pounds. It is made up of maple wood with a laminated deck. Longboards are typically made of maple wood as it renders the product strength as well as flexibility. The super high rebound urethane wheels are held securely and do not rub against anything while on the go, reducing the risk of a wheel bite. It has a pin tail deck, making cruising that much more enjoyable. This particular board is known to curve beautifully which increases the speed of the ride considerably. Made with the newest technology that is available for longboard manufacturers these days, it is suitable fo rmost side walks and residential roads. This design also helps the rider to get on and get off easily without the longboard breaking suddenly and unnecessarily. There are a couple of very good reasons listed by customers that stand out to show that this is one of the best longboards available. Firstly, it is very affordable, especially for beginners, who do not want to spend a lot of money on their very first longboard, it is a plus to have something reasonably priced as well as being of good quality. Secondly, the longboard meets all the standard quality requirements for a smooth and sturdy ride even on uneven surfaces which a rider will encounter over the coarse of the ride. The longboard if made of high quality wood and an attarctive smooth design. The height and placement of the wheels helps to avoid wheel bite and sudden breaks. It comes completely assembled, helping newbies to avoid confusion. Who need it most? When? Everyone who is interested in longboarding will definitely like and enjoy their ride on this particular longboard manufactured especially for easy sailing either as a means of transportation or something that can be used through a hobby at the park or the beach. Even though its made easy for beginners, it is also a great buy for those who are already seasoned in this kind of activity. The security and quality of this longboard is not compromised on at all. The aesthetic appeal of this longboard is attractive right on the go. The vivid color and smooth finish are immediately attractive. The superior quality along with the affordable price shows that the company put their customers interests as their main priority while manufacturing this longboard. The maple wood and the aluminium fittings keep it holding strong together as well as preserving it for long without any cracks or breakage during usage. With a 0% wheelbite it is both awesome for uphill and downhill. At 7 odd pounds, the only con a user might find in this longboard is that, on long rides and journeys, it might not be too convenient to carry this longboard as it is quite heavy. However, this problem only arises when the ride is short and the carrying time is longer. When used as a means of transport this is not a problem at all. Customers who rated the product have not rated it any less than 4.5. That is a pretty amazing rating for a product showing that it is their favorite and that they are satisfied with the overall quality and performance of this product. This rating itself is enough to know that this is a must buy when ordering a new longboard. The very first review shows that the product completely satisfied the beginner longboarder. And this sentiment runs through many other such reviews by loyal customers. Customers mention how the product was shipped immediately and how surprised they were that it reached them way ahead of the expected date of delivery. Buyers find the qualty and finish of the product amazing, just how it is described. It is not only recommended to beginners but also to pro’s as it is so well made. This longboard comes completely setup for the user. Which is a savior for those just beginning to use a longboard, they will not typically know how to set it up or at what pressure to set the wheels. Typical adjustments can be made with the help of the manual, if necessary. Can Heavy people use this board? It most definitely can be used by heavy or tall people as it is strong and capable of holding weight very well. It is described as a beginner board, can non beginners use it too? Non beginners can use it too as the superior design and the quality of the product has not been compromised on at all. The longboard comes totally assembled, minor changes can be made easily without professional help. The longboard is made with the best quality maple wood. Strength and flexibility in wood are both especially needed both in the manufacturing process where it is cut to size and moulded, as well as in daily usage. With extensive research gone into making longboards and skateboards, maple wood has come out as the winner. One can stay assured that this is the best a company has to offer in terms of material and quality. It will last the rider many years and save them unnecessary costs to enjoy their rides as it starts at such an affordable price.